Devil’s Fingers/Octopus Stinkhorn and Fairy Fingers. Local food Hub. Very many thanks to Lynne for sending me this piece recently on an amazing (first in Wales) find she made in one of her meadows near Abergorlech. Do look at the time lapse video captured by “Steve’s Nature and Travel” of a group of four Octopus Stinkhorn’s filmed emerging over just 59 hours. You don’t have to be a fungus freak to be absolutely fascinated by this amazing time-lapse video showing the ‘eggs’ of this extraordinary fungus as they ‘hatch’! Click on the youtube link below – and make sure you have sound on as the music is very atmospheric! WOW! You think…………….But what has this to do with Carmarthenshire Meadows Group – it isn’t going to turn up in our fields, is it? And you would have been right – until the beginning of the month (September 2017), when I found half a dozen sadly mangled specimens in one of my fields after the mowers had done their work. 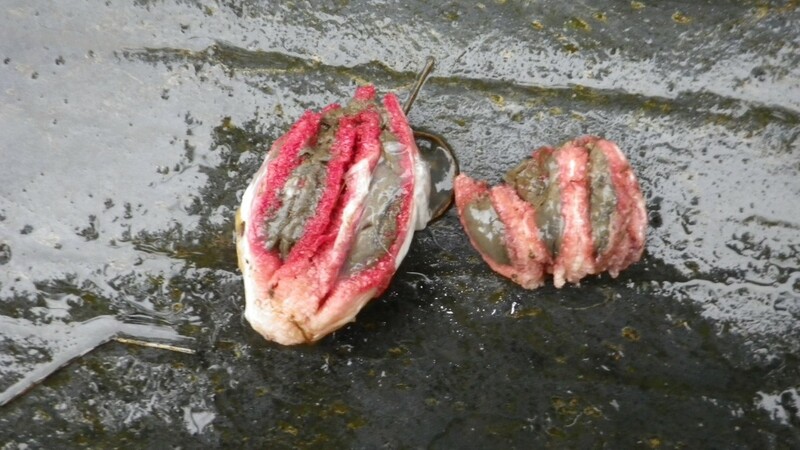 I had no idea what they were but I am fortunate enough to have a Very Knowledgeable Friend who patiently answers my endless stream of e-mails with attached photos of feathers, fungi, flowers, droppings, egg shells etc labelled ‘Whatever is this?’ – and she is always right. So the Devil’s Fingers were not only immediately identified but also described as extremely rare and quite possibly never found in Wales before! So I ‘phoned round all the organisations I could think of – Botanic Gardens, Plantlife, etc. and within a very few days my find was officially recorded as the first ever Clathrus archeri site in Wales. Special thanks to my patient friend, Dr Vicky Hassell and to Colin Cheesman of Plantlife. 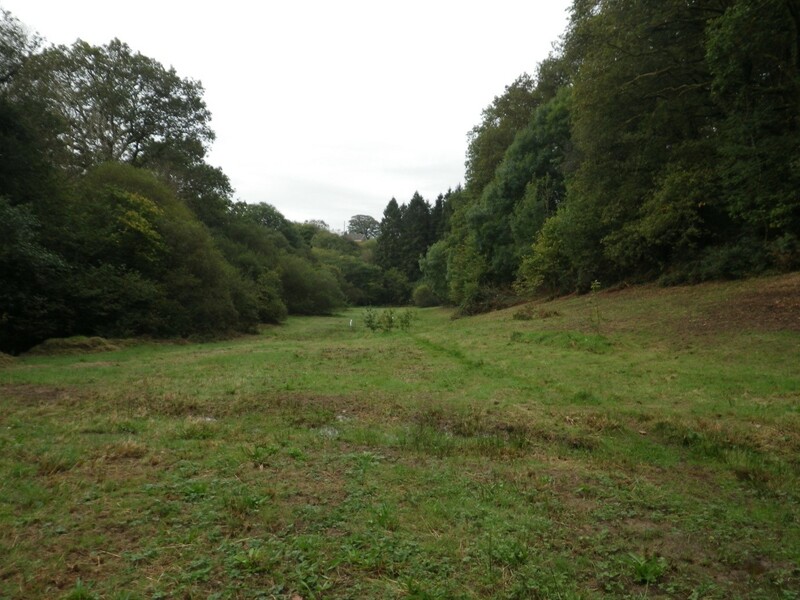 The picture below shows the field in which the fungi were found – you can just make out a little white marker beside some oak saplings, which marks the spot. Let’s have some more ‘firsts’ for Carmarthenshire Meadows! For a little more on the ecology of this fungus and when it was first recorded in Europe, please click here. The day after Lynne had told me about her exciting find, a much more benign sounding fungus popped up in our created grass free “wildflower meadow” just outside our front door. I hadn’t found this fungus before on our property, and it’s commonly called either “White Spindles”, “White Worm Coral” or “Fairy Fingers”, Clavaria fragilis, below. Click here for more on this fungus. These are saprotrophic fungi which derive their nutrition by breaking down already decomposing (mainly plant) material into simplified molecular materials which are then absorbed by the fungal mycelial network. Like the Waxcap mushrooms which are frequently found in our meadows, it’s one of a group of fungal genera called CHEG’s (Clavaria-Hygrocybe-Entoloma-Geoglossaceae), which are considered to be indicator species for old permanent grasslands. 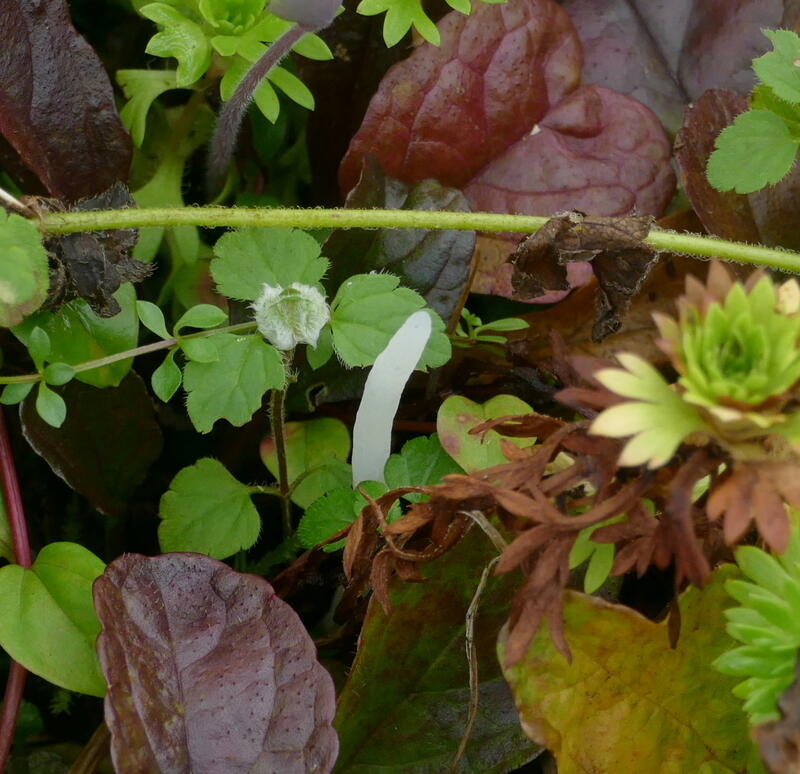 But the interesting thing is that the Fairy fingers haven’t appeared in our meadows, but rather in our magic multicultural terrace garden. Visitors will know that this part of the garden used to have a pond in it, fifty years ago, to take the water run off from a water wheel sited against the North gable wall. When we acquired Gelli, it had already been filled in, for perhaps 30 years, and was rough grazed pasture. This was then covered by us with smashed concrete and dug out shale from the conversion of the old milking parlour, about 20 years ago. So has the fungus colonised the current, almost grass free, forb based meadow now on this site? Or was it living in the previous rough pasture, and it’s taken all these years to fight its way to the surface? Finally readers may be interested in a fairly new initiative set up in the upper Tywi valley to link local food producers and consumers. Most of the food available will be produced organically as well. Called the Black Mountain Food Hub, it works as an online farmer’s market where you can browse products and order on line, and then collect them once a week from their hut near Llandeilo station. So your items are picked and packed for you, and many have very few food miles and are indeed grown very locally. The group is in its early days and obviously keen to pick up both more customers, and also more suppliers, so do check out their site and maybe subscribe to their newsletter for more information, if this is of interest. 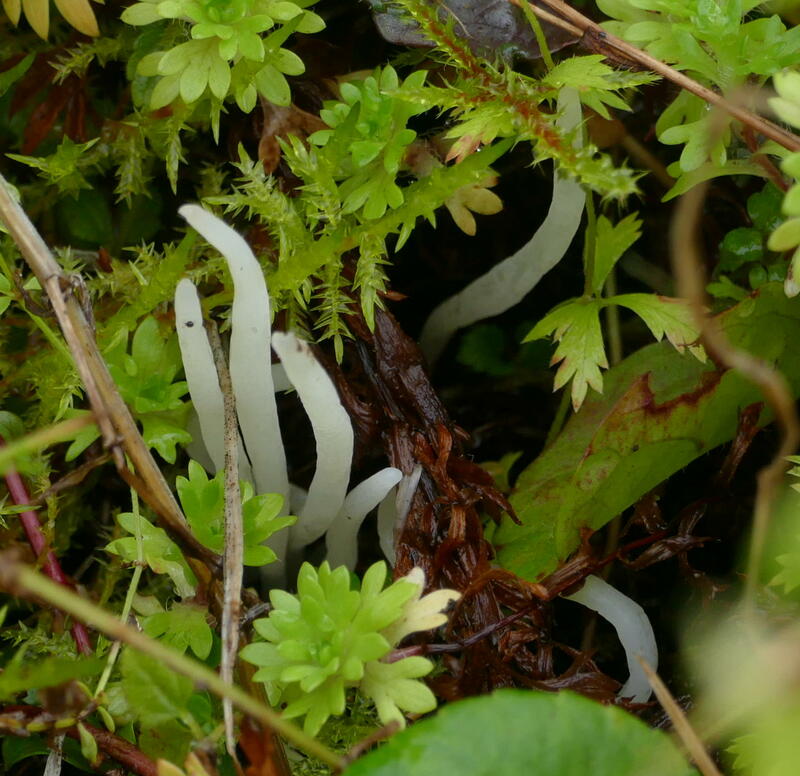 This entry was posted in Nature, Wildflower Meadows and tagged "White Spindles", "White Worm Coral" or "Fairy Fingers", Black Mountain Food Hub, Carmarthenshire Meadows Group, Clavaria fragilis, Devil’s Fingers/Octopus Stinkhorn – Clathrus Archeri by thegardenimpressionists - Julian and Fiona Wormald. Bookmark the permalink. Congratulations! 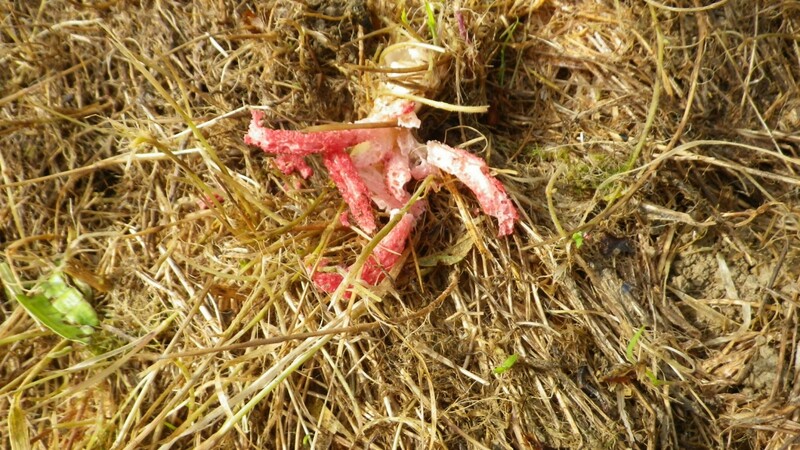 Well spotted finding your very own Clathrus archery and the first in Wales…wonder how it got there! The Black Mountain Food Hub is also making deliveries to Llansadwrn Reading Room on Saturday mornings- it’s a brilliant idea. that video is surreal, so is Lynne’s find! Strange things to find in your field! Fantastic find Lynne, well done. We’re very envious of a “first in Wales” record.